On November 3, the Federal Public Prosecutor (Ministerio Público Federal) submitted an appeal which contested the decision of the Eighth District judge seated in Acapulco, who had granted an appeal for 4 of the 5 detained members of the Indigenous Me’phaa People’s Organization (OPIM, Organización del Pueblo Indígena Me’phaa). According to the judge, there was no evidence that the four detainees had committed the murder of Alejandro Feliciano García, which occurred on January 1 of this year. The Tlachinollan Human Rights Center of the Montaña (CDHM Tlachinollan) stated in a press release on November 5 that, “This demonstrates that the state and federal executive branch retain their policy of criminalizing and fabricating evidence: Even when a federal body such as the Eighth District Court has ruled that there is no evidence, the executive branch uses the public prosecutor to keep them deprived of their freedom”. Along this line, the CDHM Tlachinollan emphasized that the Director General of Human Rights and Democracy of the Secretary of Foreign Relations (SRE), Alejandro Negrín tried “to present a false image in front of the international authorities” when he recently spoke in front of a thematic hearing of the Inter-American Commission on Human Rights (IACHR) on the Criminalization of Human Rights Defenders in the State of Guerrero. 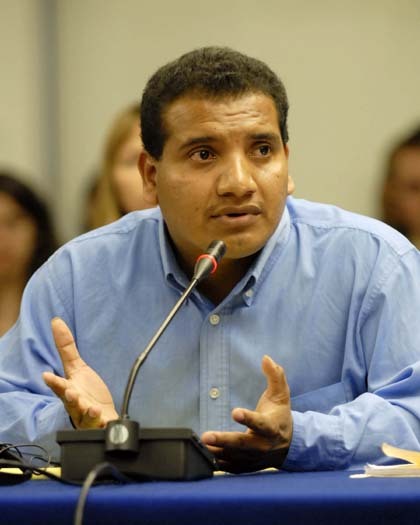 Negrín stated that the federal justice system had corrected the mistakes of the state judicial system, “He also wanted to announce that the indigenous human rights defenders from the OPIM had already been released, in order to ingratiate himself with the IACHR commissioners”. The press release of the CDHM Tlachinollan stressed that “The reality is that the federal, like the state government preserve a pattern of criminalization and fabricating evidence in order to put the social problems defined by [human rights] defenders into a judicial context and present a false image before the international authorities that are in place to respond to the [human rights] defender’s issues”. This entry was posted on Friday, November 7th, 2008 at 6:34 pm and is filed under Guerrero, Human Rights, Human Rights Defenders, Indigenous people, Justice system, Uncategorized. You can follow any responses to this entry through the RSS 2.0 feed. You can leave a response, or trackback from your own site.